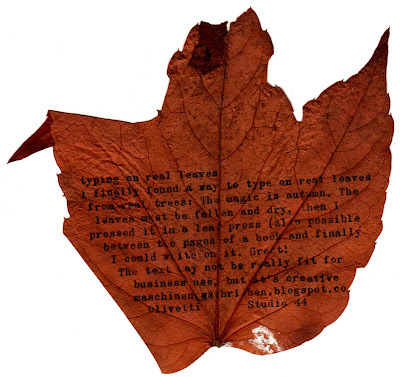 real leaf typing. no photoshop, no tricks. just a pressed, dry leaf and the beige Olivetti Studio 44. 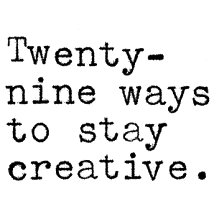 I'll probably post a how-to entry somewhen in the next weeks. Very impressive! The "must be dry" part is intriguing. I would expect them to crack apart when rolled into the platen and then explode into powder when struck by the typebars. Do tell. It's a very nice effect. I have been waiting for this one - you did a great job. Beautiful. Thanks for your comments so far! The leaves are from the vine plant (Vitis vinifera). They're quite thick. I collected some more yesterday evening and pressed them until today. The really feel a bit like paper and may be bent to a certain degree. A detailed post wil follow, that's for sure. That turned out really nice!